Peanuts are not commonly cultivated in the home garden but are an important field crop. According to Richard Jauron of the Department of Horticulture at Iowa State University, more than 1.5 million acres of peanut plants grew in the United States in 1995, yielding more than 3.5 billion pounds of peanuts. These tasty legumes are actually easy to grow at home, and they follow a predictable life cycle. The seed for the peanut plant is actually the kernel inside the shell. Plant the seeds in loose, well-drained soil once the danger of frost has passed and the soil can maintain a temperature of 65 degrees. The depth for planting seeds is about 1.5 inches with 6 to 8 inches between seeds in a row and 2 to 3 feet between rows, depending on whether the plants are the bunch type or runner type, respectively. Seeds germinate in about seven to 14 days. Seedlings grow slowly and steadily for a month. Production improves if you gradually mound loose soil around the base of the plant during this phase, when the nuts develop. A top layer of loose soil will promote and easier growth and harvest for the plants. Between 30 and 40 days after planting, peanut plants will begin to blossom. Peanut plant blossoms are small and yellow, resembling the flowers of the pea plant. After pollination and fertilization, the peg takes 10 days to bend down and penetrate the soil. About a week later, the tip of the peg begins to enlarge and the pod and kernel begin to develop. Another nine or 10 weeks will pass before the pods are ready to harvest. Using a pitchfork, gently lift a peanut plant from the soil when it is about eight to nine weeks old to check on the development. 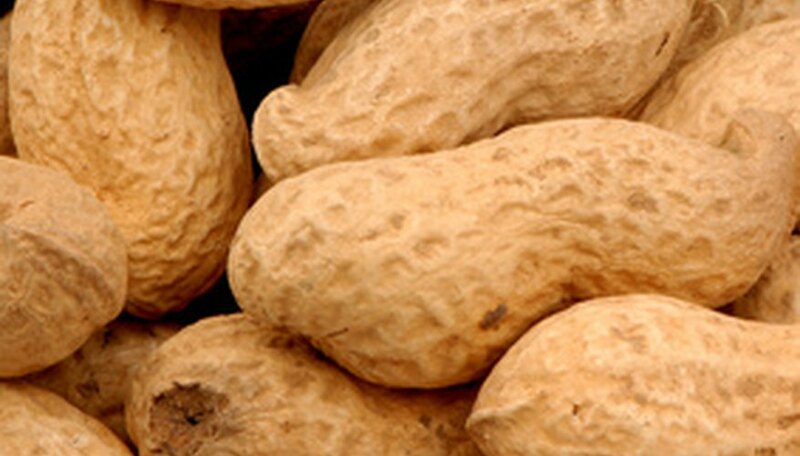 Ripe peanuts will have a dry, papery-feeling shell and feel firm to the touch. If they peanuts do not feel ready, return them to the soil and wait another week, repeating the process until the nuts have ripened. When you are certain they are ripe, lift all the plants from the ground, shaking off any loose soil, and lay them on a screen in the sun for three days to cure. Once the peanuts have cured, remove them from the plants and return them to the screen. Store them in a warm, dry location for three weeks. After this time, they are ready for eating or roasting. Some allow for storage use as seed for next year’s garden. Store peanuts in the shell.